Obviously a near-term $70 or so drop by gold will inflict some pretty heavy damage on many PM stocks. We therefore require a strategy or strategies to deal with it. Basically the choice is to set close stops that take you out of most PM sector investments if gold breaches the parabolic uptrend, or alternatively, if you want to stay long, the losses can be cancelled out by hedging using Puts, using perhaps a mix of Puts in gold proxy GLD and in the gold miners 3Xleveraged bull ETF, NUGT, where it should be noted that spreads are considerably wider than with GLD, and there are other possibilities. 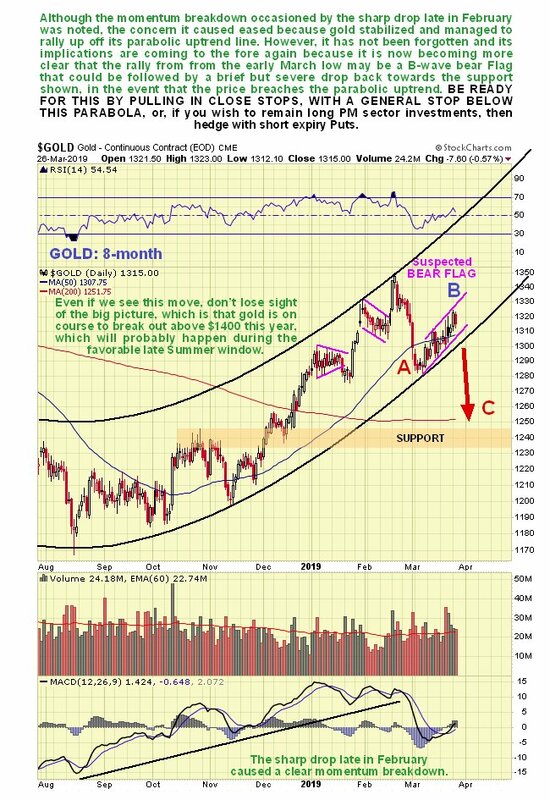 If you get taken out of your positions due to such a drop, you then aim to buy them back at a better price as gold arrives at the support shown on our chart. Note that what is set out here overrides most comments made on individual stocks, which is because they are like sheep and tend to all move together during bigger sector moves. Finally, if you agree with what is set out here, you don’t need to wait to take this evasive action, and sell at lower prices by being taken out by stops, and also pay higher prices for Puts, you can take evasive action immediately. The scenario set out here would only start to be negated by a gold breakout above the top line of its bear Flag. Posted at 7.40 am EDT on 27th March 19.